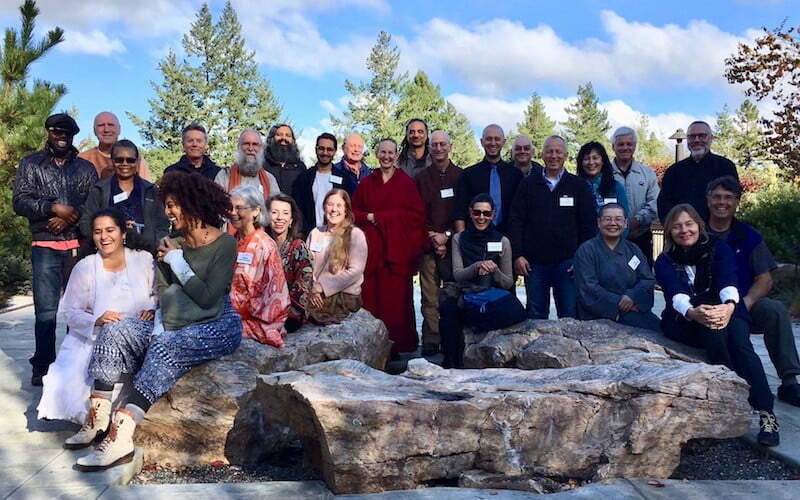 I was one of 30 practitioners from different contemplative communities across religious traditions that came together in October for an intensive 2-day conference on The Future of Dharma in America. Held in Cazadero, California, the conference was sponsored by the Global Peace Initiative of Women (GPIW). Their work is “to facilitate the wisdom and compassion born from deep contemplative and spiritual practice to help shift the collective mindset of the country from one of separation and polarization to one of unity and common ground.” They maintain that an essential part of this shift is the coming into a sacred relationship with the earth and all the living forces of the universe. A key GPIW initiative is called the Contemplative Alliance, an inter-faith or inter-spiritual movement that has held programs throughout the U.S. The purpose is to share thoughts and disseminate information on how we, as a contemplative body of concerned global citizens, can more effectively draw upon and bring forth the spiritual resources of our collective practices in addressing pressing economic, social, and environmental issues to effect social action. The Contemplative Alliance conference I attended focused on the theme of commercialization of Dharma practices, especially as seen in the growing mindfulness movement within the yogic and Buddhist traditions. Ven. Chodron and Ven. Semkye were originally scheduled to attend this conference, but because of pressing commitments and illness (respectively) they could not. I was happy to represent the Abbey in their place, but felt a bit like an interloper among such distinguished guests. The collection of conference participants was impressive, both for their diversity and depth of experience. Buddhist participants included Sensei Shugen Arnold, the abbot of Zen Mountain Monastery in NY; Zarco Andrecevic, founder of The Chan Buddhist Center in Croatia; Elizabeth Mattis-Namgyal, disciple and wife of Dzigar Kontrul Rinpoche; and their son, Dungse Jampel Namgyal, Rinpoche’s heir apparent. A bhikshuni from the Chinese Mahayana tradition also intended, as did Melvin McLeod, the editor-in-chief of Lion’s Roar and Buddhadharma magazines. Among the Hindus and Vedic traditions, there was Swami Atmarupananda, an American who ordained in the Ramakrishna Order of India in 1969. Dr. Anuradha Choudry, a graduate of the Sri Aurobindo International Center of Education, and Acharya Mangalananda, a direct disciple of the woman saint Sri Anandamayi Ma for nearly 50 years, also attended, as well as Reverend Swami Om-karananda, a psychiatrist ordained as a Shivandanda yogi; Gopal Patel, a millennial from the Oxford Center for Hindu Studies; and Sradhalu Ranade, a scientist, educator and scholar on Vedic philosophy. Among others who attended, there was Rabbi Rami Shaprio, an author of over 30 books on religion and spirituality; Naron Tillman, an African American pastor from Brooklyn, NY who works with troubled youth through yoga; and Alfred Tolle, an international business consultant who promotes compassion and wisdom in companies like Google and the GNH center in Bhutan. Is the easy movement from one type of spiritual practice to another helping to overcome the divisions and separation that religions can engender? With meditation, yoga and other spiritual practices being reduced to stress reduction tools, how are teachers and practitioners immersed in the Dharma traditions responding to this. How do we protect the integrity of the teachings and prevent their abuse and manipulation for self-serving ends? How do we reach young people who have grown up with the 3-minute meditation app? With yoga being divorced from it spiritual roots in the Hindu tradition, and mindfulness hardly associated with Buddhism, how do we reclaim the positive contributions of religion without bringing back the baggage? We had a rousing conversation about the long tradition of making offerings and donations to support spiritual teachers versus charging for teachings and retreats. We grappled with how to step out of a consumerism mentality, and how to model elegant simplicity, adopt business models whose purpose is “to employ others,” instead of making huge profits. We talked about secularization and commercialization as an American phenomenon. We discussed the idea of Contemplative Activism, addressing the idea that transformation of a society cannot take place without the transformation of individual self. We also explored the need to move from self-focus to other focus. In the last discussion, Dena Merriam, Founder, The Global Peace Initiative of Women & The Contemplative Alliance, said in part, “We have to work with thought forms. We know the importance of the Sangha. As a collective it was to bring together various sanghas and connect them so that a larger collective thought form can be of service now. “I think we have a responsibility now of building a larger collective of positive thought forms that can overcome fear through love. Love is the most powerful force in the world. It manifests in our meditation; that is how we effect our environment. The way we deal with climate change is not just by new treaties but by love, by actually loving the forces of nature, the beauty of nature and by coming in relationship with what we have forgotten. “I wanted to bring that into the circle because that is why we gather, really. The real purpose is to build a collective spiritual force that can be of service and overcome the negative energy that is being put forth. While it’s hard to point to tangible results of such a conference, I came away with a well-nourished heart and renewed optimism that a wide variety of spiritual traditions are alive and functioning well! I appreciated the opportunity to be a participant, and feel like I have established friendships across spiritual traditions that will last a lifetime.